Established in the year 1978, we, “Vishwacon Engineers Private Limited”, are prominent manufacturer, supplier and exporter of Industrial Machineries like Metal Cutting Band Saw Machines, Hack Saw Machines and Gear Boxes. Our product range includes Band Saw, Circular Band Saw, Metal Cutting Band Saw, Elevators, Home Elevators, Elevator Parts, Hack Saw Machines, Traction Machines, Power Saws etc. These products are robustly constructed and are appreciated for their dependable performance. We offer these products in varied specifications and sizes at highly affordable prices. Vishwacon Engineers Pvt. Ltd. is a technocrat engineering company with an established name as quality manufacturer and supplier of all type of gearboxes and hacksaw machines since last three decade & we have full facilities of workshop. At present we have introduce a new design of gearbox. The design of the gearbox is made in such a way that it looks so attractive & competitive. Vishwacon Engineers Pvt. Ltd. is formed with an extensive R & D work to cater all quality needs of users. 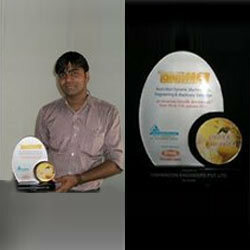 Not only at specifications level but also a manufacturing and final product quality levels. Vishwacon Engineers Pvt. Ltd. has already earned recognition about their "BHARAT" Brand capabilities to make product as per the individual users requirement to best suit to their machines parameters. Users have also endorsed our challenging capacity to make required changes in the product configuration without changing the required quality. Backed by an industrious team of professionals, we have been able to offer world class products to the clients. Our professionals keep themselves updated with the current market trends and it is because of this that we have come up with innovatively designed gearbox. These designs add to the attractiveness & competitiveness of our gearboxes. The hard work of our personnel has enabled us to develop a distinct image of our "BHARAT" brand and has motivated the users to endorse our challenging capacity to make relevant changes in the product configuration without compromising on the product quality. 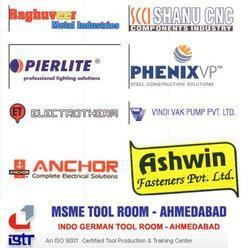 Our client list includes the major names of Anchor Enterprises Pvt. Ltd, ABP Induction Systems Pvt. Ltd, M/s. Bombardier Transportation India Limited, Kohler india corp. Pvt Ltd, Flamepack (Manipal), PTC Industries Ltd., Plant-1, M/s Umadevi machine tools and many others. Under the guidance of our mentor, ‘Mr. Piyush Panchal’, we have developed a strong foothold in the market. With his sharp business acumen and optimistic outlook, we are growing at a faster pace. To improve and maintain our potential in providing our services. To provide latest technology with a quality engineering services needed to create a nation of your dreams. To provide engineering services in a professional manner to exceed the needs of our clients. At Viswacon Engineers, the responsibility for ethical behavior is taken seriously by everyone, at every level. Conducting business honorably, ethically and with the utmost professionalism is top of mind for the people of the Viswacon Engineers. It all began way back in 1972, when Bhagwandas Panchal came to the ''big city'' in search of employment. To put his knowledge to good use, he took up jobs with the likes of Nika Tube, Gujarat Steel Tube. But like all enterprising youth, he always dreamt of running his own business. The dream finally materialized in the form of Maha Bhagwati Engineering in year 1978 after Bhagwandas’s son birth-Bharat and the brand too was named after him. An outfit that undertook job-work for other companies. Of all their activities, the most problematic one, was metal-cutting. Though there were several Manufacturers of implements in this product category, none of them were up to the mark. There was a distinct need for a quality product, in a segment that predominantly contained substandard instruments. And the Company decided to fulfill it. “If it''s not available – let''s make it!” And they did. The first in line, was a hacksaw. Manufacturers are always on the look-out for a good, durable, long-lasting product. And if it is also low-maintenance …all the better! Orders started pouring in from all over. The success they enjoyed from their inaugural venture, spurned them on to spread their wings. With a substantial investment, the Company went in for manufacture of related products. The next in line, was a hydraulic hacksaw machine. Followed by circular band saws – both swing-type as well as double column type. And then, onto heavy-duty gear-boxes. Attaining maximum client satisfaction ranks at the top of our list of priorities and all are efforts are channelized towards the same. We maintain proper interaction with the clients so as to ensure that the products offered by us match their precise requirements. Furthermore, we also conduct stringent checking of the range so as to ensure their maximum effectiveness. We work night and day with a view to deliver our products within the stipulated time-frame. All these factors have enabled us to develop cordial relationships with our valued clientele including Raguveer, Shanu CN, ANCHOR, Ashwin, MSME Tool Room, ELECTROTHERM AND PHENIX VP. Narmada Iron steel Pvt. Ltd.
Adithya Automative Applications Pvt. Ltd.